It might have taken you months in decorating your home and choosing the perfect furniture. However, the aesthetic you were aiming for can easily be thrown off by an unsightly stain or a strange odor. Though store-bought cleaners can do the trick, they are usually expensive and hard to find as well. So how can you keep your home clean and presentable without hurting your wallet? Here are five homemade natural cleaning recipes that you can put together in the comfort of your own kitchen, gathered from respected bloggers who are also concerned with keeping households clean. This fragrant cleaner can be used to get rid of carpet stains and freshen laundry, among other things. The lemon rind lends some extra cleaning power to this recipe as well. Instructions: Mix one part water, one part white vinegar, lemon rind, and a sprig of rosemary. Pour the mixture into a spray bottle and shake. Let the cleaner sit for a week for its ingredients to infuse. Read the full article from Good Housekeeping here. Instructions: Mix half a lemon’s worth of juice and a teaspoon of baking soda until a paste is formed. The paste can be rubbed onto brass with a soft cloth and then washed off. Say goodbye to spending on can after can of store-bought wood polish. You can also add your favorite essential oil to the mix for a personal touch! Instructions: Combine ¾ cup olive oil, ¼ cup white vinegar, and (optional) 30 drops of essential oil. Pour the mixture into a spray bottle and shake vigorously. To use, shake the mixture well, spray it onto wood surfaces, and polish with a clean cloth. Recipe taken from Keeper of the Home. You’ll occasionally look into a mirror to check your hair but end up counting toothpaste smudges instead. Here’s a quick recipe for a cleaning solution for mirror and glass, which you can also customize with essential oils. Instructions: Mix ¼ cup white vinegar, ¼ cup isopropyl alcohol, one tablespoon of cornstarch, 2 cups of water, and 8-10 drops of your favorite essential oil. Once you’ve poured the mixture into a spray bottle, shake it well. To use, spray directly onto glass and then wipe off. How many times have you held your breath while opening your fridge? Although they’re meant to keep food fresh, fridges frequently end up housing strange smells thanks to forgotten leftovers. Fortunately, Hello Glow has a non-toxic cleaning solution that can be used to deep clean a refrigerator. Instructions: Pour 1 cup vinegar into a spray bottle, add 2 teaspoons of dish soap and some orange essential oil, and then add warm water until the bottle is almost full. Shake well before each use. It turns out that you don’t have to spend so much just to enjoy a house that’s both stylish and clean. Most of the homemade cleaning ingredients used in these 5 recipes can be found in your own kitchen! Want to find out other ways to keep your home looking fresh and fashionable? Check out our blog for more tips and advice! Wouldn’t it be lovely to come home at the end of a long day and breathe in a light, calming fragrance? An air freshener can give your house a comforting scent in an instant. You can easily pick up a commercial freshener at a nearby store, but a homemade recipe grants the additional security of having all natural and non-toxic ingredients. Several DIY air fresheners are easy on the wallet, too! If you’re thinking of making your own air freshener at home, here are 10 recipes for you to try out. They’re easy to make, they’re reusable, and they’re an ornament on their own if you arrange them in a glass bowl. What more can you ask for? Coat several small wood blocks in the scented oil or perfume of your choice. You may do this with paint brushes, a spray bottle, or a closed container where you can shake the blocks in more oil. Leave the blocks overnight to absorb everything, and then set them out. Simply repeat the above steps if the fragrance begins to fade. Here’s one quick solution to those unpleasant smells in your bathroom. The baking soda in this DIY air freshener absorbs any odd scents while the essential oil gives off a constant light fragrance. Simply shake the mixture if you need the scent to be a bit stronger. Combine ½ cup baking soda and 15-20 drops of your favorite essential oil. Pour the mixture into a glass jar and cover it with a piece of cloth or paper. You can embellish the jar with a ribbon matching your bathroom decor. The sight of a glass jar filled with dried petals might seem outdated. However, there’s a reason potpourri remains a common sight in offices and homes: it’s actually effective at making ambient air smell fresh. You can also put together your own jar of potpourri easily. Fill a container with dried flower petals. Put a few drops of essential oil. Close the container and let the petals sit in the oil for a few weeks. This allows the petals to soak up the oil. Transfer the petals to a bowl or jar and arrange them. You may further customize your potpourri with extra oils or scented ingredients. It’s one thing to have a house filled with the savory smell of dinner, but it’s something else to have that smell last until the next morning. Get rid of overstaying cooking odors with some stovetop potpourri. This DIY air freshener gives off a scent that reaches from the kitchen to the corners of your home! Fill a small stock pot with water until it is about ⅔ full. Add a sliced lemon, some sprigs of rosemary, and ½ teaspoon of vanilla extract. Allow the mixture to simmer throughout the day. Change the mixture every 2 days if you want to maintain the scent for longer. A scented candle can set you back around $20. Meanwhile, a pound of oranges generally costs less than $2. With some careful carving, you can turn a few extra oranges into bright, round candles of your own! Cut an orange in half. Run a knife around the edges of the orange to loosen the fruit, and then scrape the fruit out with a fork. Take care to leave the inside stem intact–this white piece in the middle of the orange will be your wick. Fill the orange with oil until it’s ¾ full (any kind of oil will do). Leave it to sit for about 45 minutes so that the stem can absorb the oil. Try lighting the candle. Hold a flame to the stem for 2-3 minutes until the stem turns brown or black. You’ll need a candle lighter for this, as a match or a cigarette lighter flickers out too quickly. Once the wick has turned black, let it rest for a moment. Relight the stem. This may also take a few seconds, and there might be some crackling sounds before the candle begins to burn steadily. Ever wanted to fill the whole house with the warm, spicy smell of cinnamon? You’ll adore these cinnamon stick candles, which are as beautiful as they are easy to make. Try handing them out as gifts to friends and family. Take a pillar candle at least 3 inches in diameter. Measure its height and cut around 20 sticks of cinnamon to size. Use a hot glue gun to attach the sticks vertically to the side of the candle. Make sure that the sticks lie snugly beside each other. Tie some twine or ribbon around the candle. Not only does it complete the candle’s look, but this will keep the cinnamon sticks in place even as the candle and the hot glue melt away. You might not be all right with the thought of having an open flame in the house, especially if there are children or pets around. A DIY gel air freshener is a great alternative to scented candles. One 8-oz jar of this freshener can last you up to a month! In a heatproof jar, combine around 30 drops of fragrance and a few drops of food coloring. Boil 1 cup of water and mix in 4 packages of unflavored gelatin. Keep stirring to prevent the gelatin from clumping up. Add a cup of cold water and a tablespoon of salt. Continue stirring. Pour the gelatin into the jars and mix it with the fragrance and food coloring. Let the freshener set overnight. Decorate the jars as you wish! If the jar has a lid, punch a few holes in it before screwing it on. This will help the freshener last longer. Another flame-free DIY air freshener, reed diffusers make for a quick, simple project and an eye-catching decoration. Plus, you can also use them over and over as long as you have scented oil in stock. Fill a small vase or jar with essential oil, and then fill it to the brim with baby oil. Place bamboo skewers or rattan reeds in the vase. You can decorate the sticks beforehand with washi tape, tiny flags, or paper flowers. Tie a ribbon around the vase as a final detail. Worried that commercial air freshening sprays might contain harmful chemicals? You can easily whip up your own non-toxic alternative! Pour ½ cup of water into a water and bring it to a boil. Add 4 tablespoons of dried basil and allow it to steep for a few minutes. Line a funnel with coffee filter paper and place it in the opening of a clean spray bottle. Pour the basil mixture into the funnel. Remove the filter and then add ¾ cup of boiling water, 1 tablespoon of vodka, and 5 drops of lemon essential oil to the mixture. Cap and shake the spray bottle. The fragrant orange-clove pomander ball has been making homes and closets fragrant since medieval times. Hang them up to spread their spiced scent or drive pests away from pantries and other storage spaces. These DIY air fresheners are also a wonderful craft project for kids! Poke the pointed ends of whole cloves into the rind of a fresh orange. You can arrange the cloves to form designs and patterns on the pomander. If you want to hang the pomander, simply thread some ribbon underneath the skin and tie the ribbon in a loop. For a richer aroma, you can roll the pomander balls around in other spices such as cinnamon, nutmeg, and cardamom. Say goodbye to stale and unpleasant odors! Bring luxurious scents into your home with these 10 DIY air fresheners, and you’ll feel relaxed from the moment you walk through the front door. For an even more comfortable atmosphere, try keeping a few pots of low-maintenance plants around the house as well. Did you find this article interesting? Visit our blog regularly for more tips on home improvement and interior design. How do you turn a blank wall into a useful one? Simple–install a shelf system. This wall piece, or a furniture as you may call it, can be as beautiful as it is functional. There are a lot of shelves that could fit any kind of interior design. And there are many ways than one to install and stack them together. 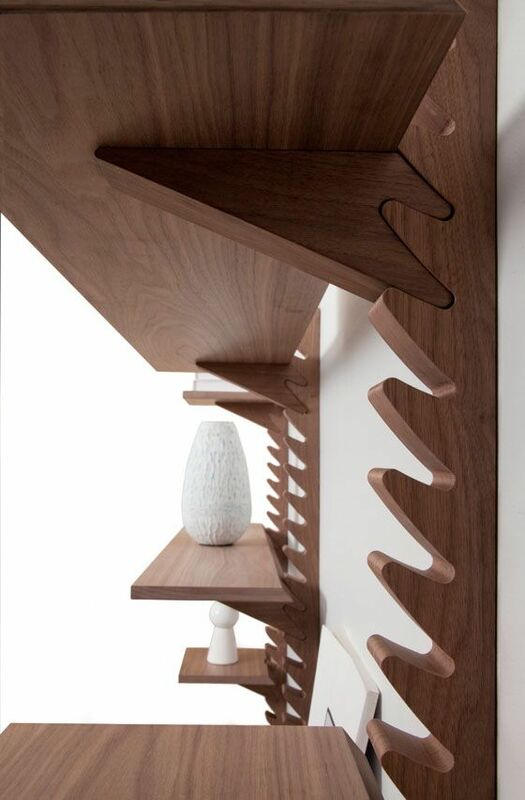 In this listicle, we give you nine ingenious shelf designs that will fit your style and needs. This shelf idea from Apartment Therapy transforms your usual adjustable shelf into a pegboard-like one. In this shelf system, you can always add storage or free up space anytime you want using only plywoods and dowels. Floating shelves are a popular choice for a seamless storage system. 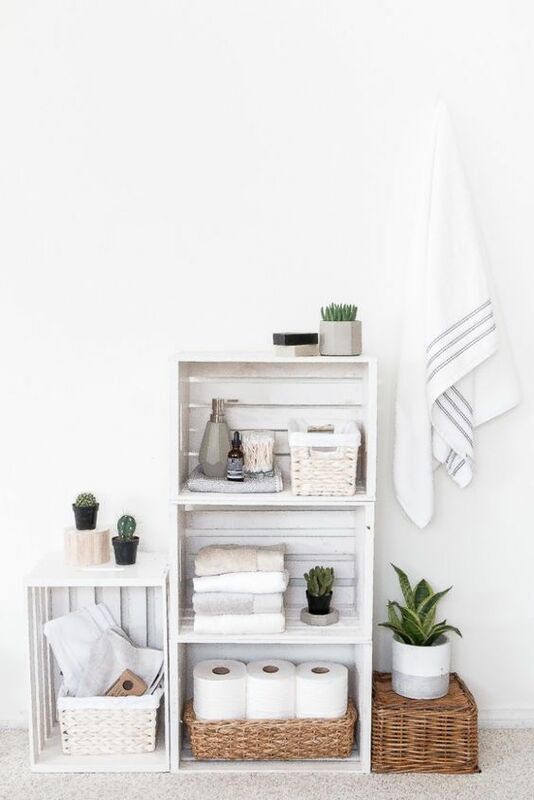 What’s great about this shelving style is that it goes well with any design theme. You can work with wood planks, hardwood, log slices and whatnot. 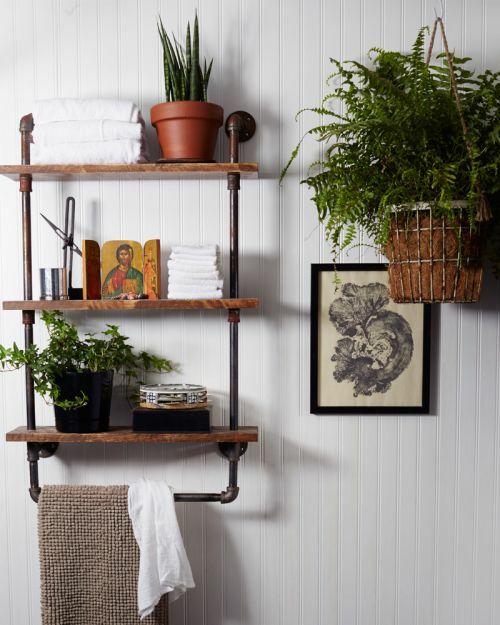 Steel water pipe when paired with choice wood makes a modern rustic shelf. Aside from being a sturdy material, one good thing about water pipe is that it is built for twists and turns which definitely will suit whatever style you want. You only need joints to do this. With customized shelves, you can turn your dead space corners into functional ones. This trick is useful just for every part of your home: for the walk-in closet, bathroom storage, for bedroom decor and others. Aside from your usual wood planks, you can use a woven basket or wine crate for a shelf. Just place its base up against your wall. And voila! You get a rustic shelf design. 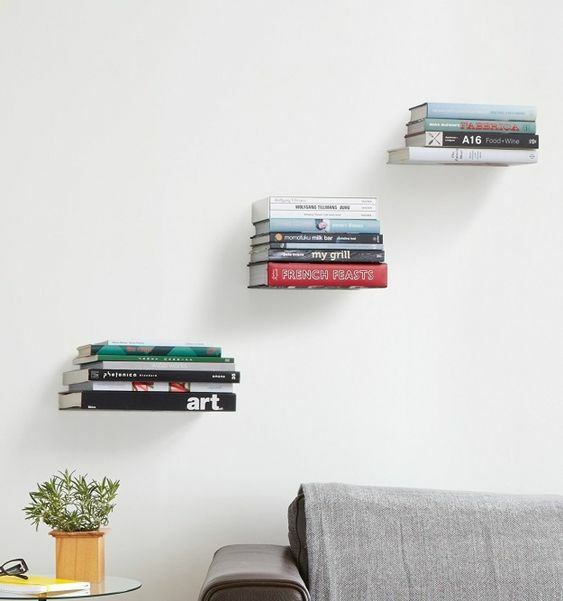 Stack up your favorite books afloat in your invisible floating bookshelf. 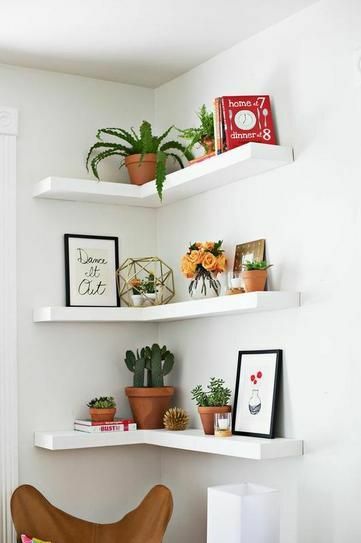 One way to spruce up your floating shelves is to use your big hardbound books instead of your usual wood planks. This works best for your bookshelf. This DIY will guide you through building your own invisible bookshelf. Instead of throwing away your old wooden ladder, why not turn it into a great rustic looking shelf system. Be it a straight ladder or an A-frame ladder, you can turn them into shelves without the need for much carpentry skills. Just follow these DIY tutorials for Straight Ladder Shelf and A-frame Ladder shelf. For a nautical-themed shelf, use thick ropes to support and frame your wood plank shelf. This DIY is so easy, everybody can do this without taking much of your strength. And it works best to hold your decors, books and bathroom items. This shelf system is designed to provide storage space just when you need it. This window type shelf designed by Malte Grieb lets you close the shelves when not in use. An ingenious design indeed, this shelf is perfect for every part of your home and for any items you want to use them for. Do you find this article helpful? Share us your thoughts by commenting below.